What Courses Do You Take When Getting a Degree in Contemporary Christian Music? If you are looking to procure a degree in contemporary Christian music, a precursory search will show you that not many colleges offer this option. However, that does not mean that one cannot be obtained. If you have a passion and dream of becoming a Christian recording artist, then a degree in Contemporary Christian Music or commercial music will be a good fit. Finding the school that has the precise degree will most likely be the difficult part. However, read on to find out what courses are normally taken in a Bachelor’s in Contemporary Christian Music degree. You might find that public commercial music degrees are very similar. Finding a degree in Contemporary Christian music at a state-funded public university will be hard to do. These specialized degrees will be found in private Christian colleges and universities. However, if a state-funded public school is your only choice, doing research on private school contemporary or commercial music departments, should pave the way for you to create your own major from the public institution. Find out what courses are common in a Contemporary Christian Music degree and then tailor your degree to match that of a private university. 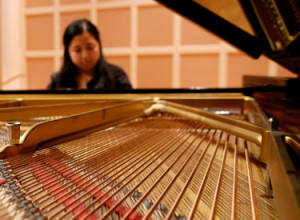 In addition to the above classes, Contemporary Christian music majors will also need to take the regular music classes such as piano, music theory and analysis, aural perception, ensemble classes, music history, conducting and semester juries and recitals. It is a strenuous schedule, but you will find that a music major is easy to focus in on the area of expertise that you desire. The main difference between a Contemporary Christian music degree at a Christian university versus a public university commercial music degree will be the general education courses and the focus on the subject matter. Christian universities will have courses focused on Biblical music and Biblical history, while a public university will not and will take a secular approach to teaching. Those who receive a Bachelor’s in Contemporary Christian Music have a large choice of careers ahead of them. Similar to a secular performing arts degree, a Contemporary Christian Music major could become a touring artist, a recording artist, a songwriter, an arranger or a music director. Each of these careers are specialized and focus more on the business side of music than a degree in music education or classical performance. Though this degree may not be as popular as music education or classical performance, it is a specialized degree for someone who would like to be an aspiring songwriter, performer or artist in Christian music. The courses will be similar to those any any music major, but will have a strong business background. With the right passion and focus, you can take your Contemporary Christian Music degree and pursue your dreams.